Your resume must stand out. Recruiters and HR departments receive lots of resumes. The objective of a resume is to get an interview so you can sell your unique qualifications and demonstrate how you can help an organization move forward. We develop marketing documents to serve as your "ambassador" to make you memorable. The development and production of a resume has undergone critical changes as the job search environment has changed. Candidates now must create a "marketing document" that communicates their value and personality to the potential employer or recruiter in a scant 4-6 seconds or find listing placement according to a computer’s logic. A historical listing of past job duties and responsibilities will not get noticed. Today’s resumes focus on talent, quantifiable achievements, core competencies, and your personal brand. 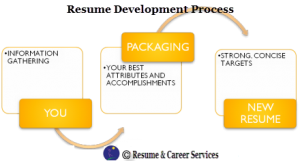 Yes, you must be "packaged" so that your attributes, working style, values, attitude, and expertise leap off the page at a glance. Communicating all of this in a Twitter-style world…"tell me quick and make me care” is our challenge. A resume is designed to get you the interview, it is then up to you to "sell" yourself, but first you must get noticed. The question is how to capture the essence of "you." 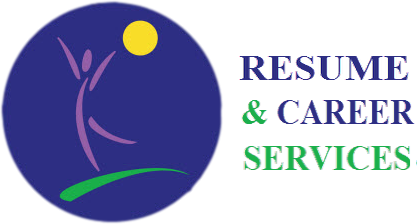 At Resume & Career Services we probe to understand your motivations, validate your goals, values, working style, natural talents and then shape an image to promote you. Our process is shown on our Resume Development Process chart. The ultimate goal of developing the resume is to capture you as the brand. Creating that brand is often the most valuable portion of our services because we help clients put into words, sometimes for the first time, what’s important to them in a job, in their life, and where they want to be in the future career-wise and personally. And this is just the development of the resume, we have not discussed the other supportive documents; cover letter, LinkedIn profiles, online identity, social media outlets, job search technology, etc.